Many thanks to Alan for sending me some photos of Chertsey in both the Saturday and Sunday parades. 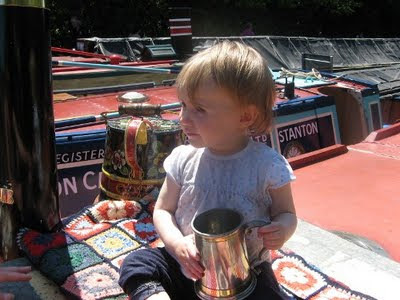 (You might have noticed that I have hardly any boaty photos from Braunston this year. This is because I determinedly took my old 35mm SLR camera with the intention of using up my final half dozen rolls of film - in the event I was so busy I only got through one and a half. But all the same, not many digital snaps). This is us having just come out of the marina under the Ladder bridge on Saturday. This manuoevre was completed perfectly (even if I do say it myself) largely because sheer luck left us in the right position after lots of waiting while boats not involved in the parade were 'bypassed' through the marina. You can see that I'm 'rowing' the tiller. Some people say it works; some say it doesn't. It must depend on the boat because I can say with certainty that it does work, as a way of bringing the front of the boat round at very low revs, with hardly any forward movement. We got round the moored boat on the offside without having to reverse. This is us attempting to go into the marina on Sunday. This time Chertsey didn't start in the right position and I made a bit of a mess of it, compounded by the fact that the engine then stalled. Nonetheless we rescued the situation by dint of Halfie fetching the long rope from the T-stud and Tony hopping off and pulling the front round, so that by the time Jim had restarted the engine we were round the turn and ready to steer through the marina. What a team! For those who can't quite face the gruelling BCN Marathon Challenge, Braunston this year offered an alternative test of nerve and patience, otherwise known as the 'Parade'. Prior to last year, all the boats present participated in a single parade, which became known and dearly loved for its chaotic nature. In 2010, when ninety-plus boats attended, a new regime was implemented of twice daily parades, with half the boats taking part in each (although the year's featured boats in the basin can go in all of them if they want). This was felt to have worked exceedingly well, so was reproduced this year. Thus it was that Chertsey was ready at eleven o'clock, all passengers aboard and engine fired up, ready for the off. Now if I'd had a bit more experience of this I would have known that being tail-enders in our spot by Butchers Bridge, it would take a while before we actually moved off. I wouldn't have reckoned on it being two hours though. So... we finally set off at one. 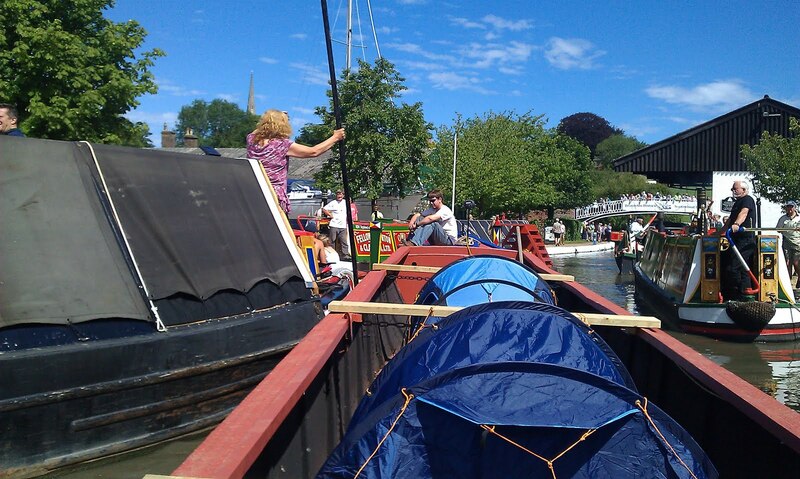 The parade course runs from a given boat's starting point down the canal to Braunston Turn, where we... turn. We then come back up as far as the main Marina entrance where we turn in, turn left and negotiate between the pontoons to emerge at the other end under the ladder bridge back onto the canal, to resume our original position. This route I would guess would normally take ten to fifteen minutes. We were back in our place at twenty to five. Ahem. Most of the hold ups appear to have been caused by boats getting stuck on the bottom, a fate which fortunately did not befall Chertsey. Because the going was so slow, I was able to manouevre quite impressively (certainly better than on the Sunday), and had a wonderfully appreciative audience of (latterly cross-legged) passengers - Bones and two friends, Neil (who has written a great post about it) and Kath from Herbie, Caspar Ghost and his brother Sleepy Hollow (OK, Gary and Kevin) from CWF plus Gary's daughter; Bill and Michelle from Shilling, and Adrian and Linda, now of Warrior. Afterwards we repaired, naturally, to the beer tent where people and conversation ebbed and flowed delightfully until it was time for day visitors to leave for home. Of course Braunston is also a marathon of non stop partying and on our return from the Sunday parade I wondered over to the marina and ran into Alan and Cath (Sickle and Chalice) and, a lovely surprise, Graham and Jane (Alnwick). We stayed chatting so long that we were given free beer, clutching which we wondered back to Chertsey to chat some more. Then after they left to find some dinner, we got into conversation with Nick Hill, and it was nearly nine when we rushed into the Nelson just in time to order food, Bill and Michelle, whom we were supposed to have been meeting on the way, having very sensibly given up waiting and were already in there. Browsing and catching up on my favourite blogs this morning, a little phrase leapt out and caught my eye. Who said it isn't important (Adam, if you're reading this please forgive me); I just thought it was the sort of thing that would boggle the mind of any ordinary person, whilst being immediately comprehensible, and indeed a matter of sympathy, for any boat owner, particularly one with a macerator. Depending on whether we can find our way around a little car problem (cracked auto box fluid pipe) we should be headed for Braunston today, or failing that tomorrow. Therefore you must not expect long posts and certainly no photos until I get back, but keep an eye on the Twitter feed and I'll try not to bore you to death. Look forward to meeting you there! 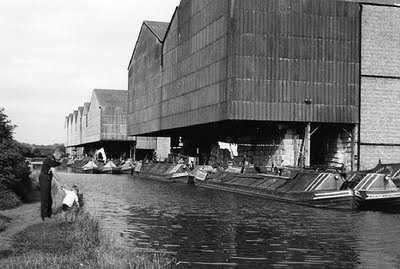 Croxley Mill, somewhat earlier than Chertsey's delivery there. One of my favourite photos, reproduced by kind permission of Diamond Geezer. This probably represents Chertsey's last commercial load, and almost the last canal borne coal to Croxley Mill. The traffic, which began in 1824, finally ended just a few days later. The story, in which Chertsey plays a small part, of the attempts by the Ashby Canal Association to keep the canal open by securing carrying contracts, is told by Gerald Box in Clinging On: The Moira Cut, Coal, and the Last Days of Carrying. (Available from the IWA shop). It's not sparklingly written, as the title might betray - I believe it started life as an MA thesis - but it's fascinating reading for anyone with an interest in the last mini-rennaissance of canal carrying in the late sixties. This was a time when the big companies had long since given up trying to make canal transport pay (as early as 1949, after the Docks and Inland Waterways Executive - later to become BW - had taken possession of the GU fleet as part of the nationalisation programme, the biggest independent carrying company, and one of the oldest, Fellows, Morton and Clayton, had voluntarily sold out to them). Smaller outfits, with what we would now call leaner operations, such as Blue Line and Willow Wren had entered the fray and taken over a number of boats from the rapidly dispersed BW fleet in the fifties and early sixties, but by the late sixties they too were feeling the pinch, as more and more cargoes were moved onto road transport. Factory arms were being closed and filled in, and canals across the country were being effectively, and often legally, abandoned. By 1970 Blue Line was just about hanging on - their 'Jam 'ole Run', which ended in November 1970, is generally held to have been the very last regular long distance traffic - but increasingly the few remaining traffics were being carried by the new No. Ones; rather different perhaps from the traditional, proud owner-operaters of earlier years; people, often young people with no canal background who had purchased a boat in one of BW's regular disposals and dreamt of a life working the cut, 'following the trade' to use Tom Foxon's term; picking up loads as and when they could, and hoping to do no more than sustain themselves but to find their reward in the hard but attractive lifestyle of a boatman. One such young person was Richard Barnett. In 1969 he was a newly qualified accountant, but presumably the prospect of a lifetime spent in some back office did not appeal. 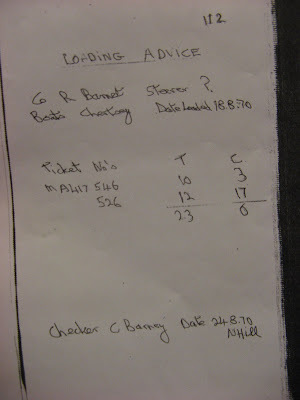 So he purchased Chertsey - not direct from BW, as they had disposed of the boat in 1962 or 1963, but from the subsequent owners (and who they were remains a bit of a mystery, these being Chertsey's 'missing years'). Richard Barnett's business partner at this time - unofficially, for reasons that will become apparent - was a student called Richard Pearson. It was in fact the latter Richard, who had barely steered a boat before, who was entrusted with bringing this 23 tons of coal from Gopsall Wharf on the Ashby Canal (on the Leicestershire/Warwickshire border) to John Dickinson's paper mill at Croxley on the Grand Union near Watford. Nick Hill has the steerer down as ? on the loading note; I was able to tell him that it was Richard Pearson having met Richard at Braunston last year, when he told me the story. 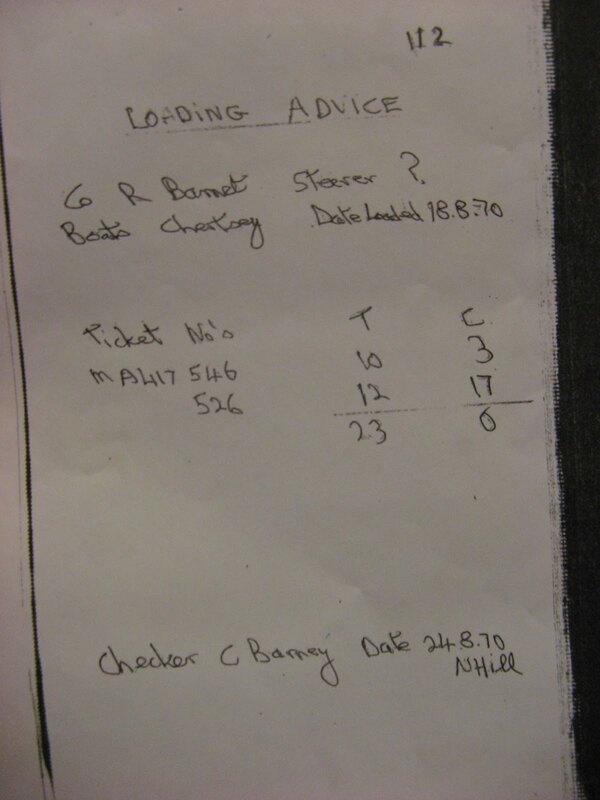 The continuation of this contract represented a victory for Nick Hill (he who signed the loading chit nearly forty one years ago and who was helping to fit Chertsey's new gunnels the week before last) and others on behalf of the Ashby Canal Association. Keeping traffic moving on the canal was primarily begun as a means of keeping it open, preventing it from silting up, being choked by weed, and being abandoned, after its upper reaches were closed by mining subsidence. After Willow Wren pulled out, the Ashby Canal Association formed a trading arm and took over the contract with the paper mill itself. It then subcontracted the carrying to anyone who was willing and able to take it on. The story of the chutzpah with which they achieved this, and through it their ultimate aim of keeping the canal open, is worthy of a post in its own right. Since a branch of Lidl opened in Newhaven earlier this year, our lives have been transformed. We are genuinely spending less on food and household shopping, partly because it encourages us to shop around, and partly because sometimes things are very cheap. Good things too, not the second or third class stuff that passes for most supermarkets' economy ranges. But there are other good things about it too. Firstly, there is not masses of choice. One brand of tinned tomatoes, one brand of beans, one brand of cat food. Take it or leave it. It saves time as well as money, and is strangely liberating. There's no piped music and no pseudo TV and radio stations pumping out adverts. It's light and bright and clean and the staff are efficient, whilst not wasting their energy on pretending to be my friend. They sell all sorts of mad stuff. Waders, diving suits, sticky backed plastic. Our first ever Lidl purchase was a shower hose costing £2.99 in the branch at Langley Mill. We despaired of getting any hose - and they were costing up to fifteen quid - to last more than a few months before springing a leak. The Lidl one is still going strong three years later. The last thing that makes Lidl fun - and this must be their secret weapon - is that you never know what's going to be a real bargain from day to day. Prices go up and down from one day to the next. Naturally that keeps you coming through the doors; fortunately we don't live too far away. And today Jim has just been back to stock up on the current beer offer: Shepherd Neame Masterbrew (a very nice bitter) and 'Summer Sizzler', at 99p a bottle. I tried a Summer Sizzler yesterday despite the rather pathetic name and its name belies it, suggesting a light summer beer when it's actually a rather lovely (4%) IPA, so there are now a dozen bottles of it in the beer cupboard. My thoughts have been turning to Chertsey's ballast situation. At the moment we're carrying something in the region of three tons of canal water (possibly less as some has slopped out or evaporated over the past year...). This takes up an awful lot of space, being as it is kept in three large tanks sitting in the middle of the hold, necessitating squeezing through an 18" gap to get past them. Any more and I'll be needing a Boatmaster ticket! I hope I haven't forgotten anyone. You're all very welcome, and there are two parades, so I'm sure there'll be room for everyone. Since Easter I've collected a few more townie photos for the album. Pleased with this most recent one - last seen when I was on its home turf. I was also very pleased to have identified it from the first sight of big Northwich stempost and those louvred windows. 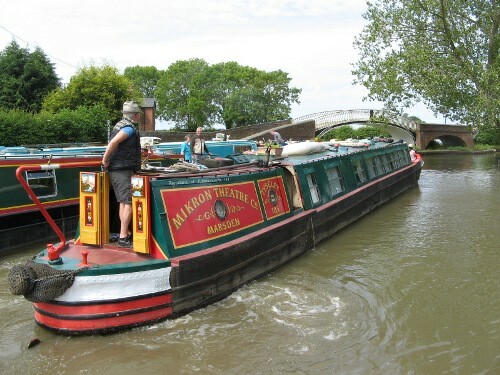 It's Tyseley, home of the Mikron Theatre Company, who are currently touring down south, and will be putting on a show at Braunston. It's been a bittersweet weekend, with a few tears, as we've cleared our goods and chattels from Warrior ready for its new owners. One thing we can't be accused of however, is taking the lightbulbs with us - in fact we are leaving what must be a lifetime's supply of spare bulbs. As the Moomins were at Bill Fen as well, we decided to take a valedictory trip to the George at Ramsey Forty Foot. This pub has changed hands so many times since we started visiting (and this visitors' book has been lost and found again) but I think last night saw it at its best ever. Friendly service, excellently kept beer and decent food at very reasonable prices. It was empty when we arrived but shortly after we ordered, a family group sat at the next table. There was soemthing so familiar about the man I could see, I thought he must be a boater I'd previously encountered, but I couldn't for the life of me think of where. Then one of his party asked him 'When do you start rehearsals' and I realsied that if he was an actor, I'd most likely seen him on the TV (which I haven't watched for ten years now), and for some reason my first thought was The Bill (perhaps because every actor in Britain has been in it at least once). Over the course of the evening I becam certain this was where he was familiar from, and indeed, when I got home and looked at some pictures, confirmed that he was indeed Tony O'Callaghan, who played Sgt Matthew Boyden. Further research solved the mystery of what he was doing there of all places - he grew up in Ramsey. I think however that David Trimble remains the most important, if perhaps not actually the most famous, person I've encountered in a pub while boating - and I actually spoke to him. 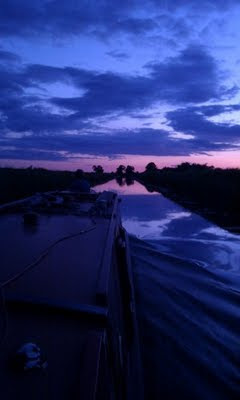 We left around ten and navigated after dusk in brazen contravention of the Middle Level byelaws. Despite a heavy coating of weed, Warrior cut through the water as smoothly and as beautifully (and as fast) as ever. Moominpapa and I both captured the occasion - me on my ancient Canon PowerShot A700, and Moomin on his HTC Desire. His is sharper, but bluer. I'm not a superstitious person. I'll happily walk under a ladder (as long as it's secure and there isn't a precariously balanced tin of paint at the top) but there are a couple of superstitions I'll respect, either because they represent a nice idea or a kernel of good sense, or because of a link with tradition. "I learned that if you cross a threshold to go on a journey," she says, "even just to buy flowers down the street, you are not allowed to turn around and cross again until the journey's done – so if you forget your money, you're crap out of luck! You can be like, 'Please give me the money,'" she waves her arms wildly over an invisible threshold, "but my grandmother would physically hold me back." That appeals to me; the idea that if you start a journey, whether a physical or a more metaphorical one, you should not return until you've completed it. Other little superstitions I adhere to are that you should never give anyone a purse or wallet as a gift unless it has a token amount of money in it (also mentioned by Obreht), and also regarding gifts that if you give - or are given - a knife or scissors, or anything similar, you should always accept or give a token amount of money in return - things that can cut should not be given as gifts. One superstition I grew up with, that I never came across anywhere else, is that if you bang your elbow, you should always bang the other one. It took me a while to grow out of that. I suspect it was a ploy on my mother's part to distract us from the pain. Finally, a boaters' superstition mentioned in Tim Wilkinson's Hold on a Minute. His wife brushes her hair and on pulling the loose hairs out of the brush, goes to throw them in the canal. The young boy from a boating family who's crewing for them is aghast at this, and tells 'missus' that she'll go bald if she does that. As Wilkinson explains, the sense behind this is not to throw anything in the cut that could get caught round someone's blades. Instead, she is told, she should put her hair in the hedge for the birds to take for their nests. Ever since reading that, I've propitiated the fates by never throwing so much as a single hair into the canal, because I like having that link with that advice from the past. Off to Warrior now, to start to clear our stuff out ready for its wonderful new owners. Lately I've started - partly of necessity - to enjoy getting some practice at going backwards. 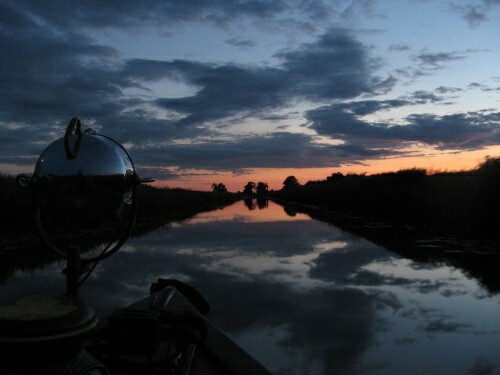 Whether it's possible to steer a narrow boat in reverse is a matter of some debate, but what it comes down to is, it depends on the boat. With its big, balanced rudder and superior underwater shape, I would guess that a boat like Chertsey steers as well as any in reverse. Which is to say, of course, not really all that well. To steer at all in reverse is an achievement. As I say, I've been having some practice lately. Winding round the turn at Braunston is a treat - done it twice now so that bit of the parade holds no fear for me now. And the week after next there'll be a bigger challenge. We couldn't leave Chertsey on the 14 day mooring on the North Oxford any longer, so we've gone up the GU, up one lock, and left it in the pound there. Now, it would be another four locks to the winding hole, IF the winding hole was operational, but it isn't, so come the rally we're going to have to go backwards back down the lock and as far as the marina, and wind there. That'll be exciting. I have gathered some reversing hints from various people. Obvioulsy (well, fairly obviously) steering in reverse entails moving the tiller in the opposite direction to when going forwards. It can be very disorientating though trying to work out which way this is (for me anyway) so thank to Mike for the simple mnemonic of pointing the angle of the swan's neck in the direction you want the back of the boat to go. Thanks to Andy for two further sage pieces of advice: when reversing, watch the FRONT of the boat, not where you're going (except for occasional glances), and always go back further than you think you need to. And finally, my own recent observation - don't be afraid to wind the revs up, because the great thing about going backwards, is that you can always stop. One accusation that can't be levelled at Jim is a failure to get around to putting shelves up. No sooner had I said that I thought that a small shelf over the bed would be a nice addition to Chertsey's cabin (and provided him with the measurements) than a suitable piece of wood was found, cut to shape and varnished ready for installation. 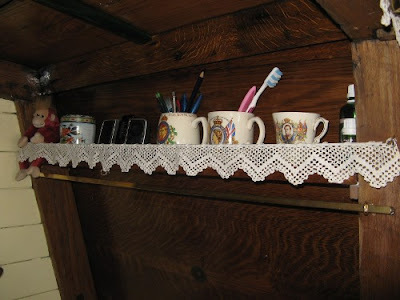 Meanwhile I had found a suitable piece of lace and a length of net curtain wire, the primary purpose of which is not to look decorative (although it does) but to stop things falling off. My collection of coronation mugs is additionally Blu-Tacked in place for added security. I couldn't wait to get these out - two from 1937 (including one, the little Edward VIII one, which was owned by my father from that date) which is of course also the year that Chertsey went into service - and one from 1953. They've had to earn their keep as repositories for pencils, toothbrush etc - there's little space for anything purely decorative - but I think the whole corner looks lovely now. I've repositioned the brass rail underneath for hanging neclaces and suchlike on. They need to come home again for a good clean (they've been lacquered at some point) but I couldn't resist posting a photo of my new hanging rails. Could have been made to measure! Imagine them all Brassoed and the ancient worn iron links blacked with stove polish. Now, I can no longer get the kettle on top of the Primus on top of the stove (well, not without a bit of a wriggle) but that's a price worth paying. Please ignore the removable light fitting that I somehow failed to remove - brilliant they are, from B&Q; I've got four of them, they take AA batteries which last a good long while, have 27 LEDs each, and a hook to dangle from and a magnet to attach to the iron frames in the cabin. Best of all they can be moved about, carried in a handbag for use as a torch, and removed entirely for that traditional look in photos. When I remember. 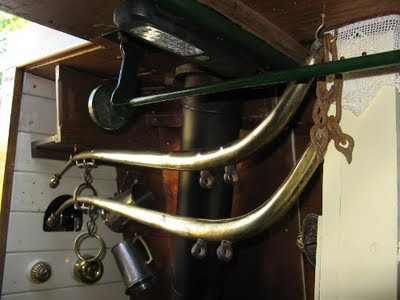 You will recall the I got my chimney chain (in Ely) from an old piece of decorative horse harness kit, plus of course various horse brasses. Well, today we were mooching about in Lewes and my eye fell upon these items, which I am hoping might serve as a hanging rail or two over the cabin stove. 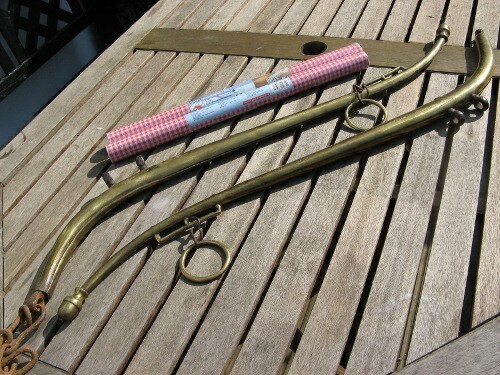 They're gorgeous and obviously old (from the wear on the links); brass wrapped around (presumably) wrought iron. I'm not quite sure what part of the harness they constitute, but they are stamped 'patent', 'solid brass', 'double cased' and 'No. 4'. I just hope they'll fit somehow into the space between the ticket drawer and the table cupboard. Talking of which, just browsing in the Aladdin's cave that is Lidl, I came across rolls of sticky backed plastic, so I have purchesed two rolls in a red gingham pattern to give that authentic fifties look to the shelves inside.